We are Ruffa and Michael Paglalunan, a husband-and-wife photography team who love to share modern fine art imagery inspired by love and life. We’re based in Philippines capturing weddings and portraits with omnipresent and fashionable approach. Our passion is to capture exceptional spark between couples, family and friends genuinely from our unique imaginative perspective. Choosing the photographer on our wedding day is very hard, there are so many wedding photographers to choose from and we could have end up choosing the wrong one and looking at bad photos. 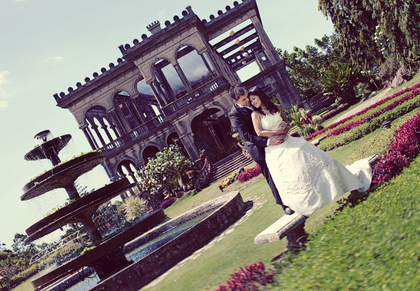 Indeed we were very lucky that we got the best photographer out there, Ruffa & Mike Photography. We never doubted Ruffa & Mike because it was obvious that their combination is truly a wok of art. They have a very unique concept, imagination and talent in the art of wedding Photography. It’s a mix of artistry and creativity that the output pictures are very good that we end viewing it almost everyday for 3 weeks. They captured every emotions and details during our wedding which I my self a as groom missed some of those moments during my wedding day. It's fun to work with them, we can see their effort and passion on each and every shot just to get the perfect one. As one of their client we are very satisfied customer and the output exceed beyond our expectation. We highly recommend this guys and we guarantee with no regrets. Dwin and I would like to express our extreme gratitude to you both for the absolutely wonderful memories of our wedding day that you have captured for us. Your ability to be flexible and provide us with a package that suited our needs was most important to us. We thank you for that. Finally, the most important reason why we would recommend your services is the quality and presentation of our photographs. The photographs were so incredibly beautiful, it was difficult choosing which ones to put in the album and which ones to get enlarged. Not only do we think they are great, but everyone has commented on what a fantastic job you have done with the photographs. We would recommend your service to any couple that are looking for the perfect photographs of this special day; and will definitely be recommending your services to everyone! Again as sincerely thank you for being a part of our special day.